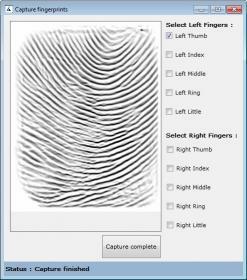 Fingerprint Authentication System Software is developed by BioEnable Technologies. 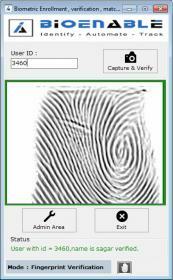 It is used for Registration, Verification and Identification of Fingerprint biometric data . Simple wizard base registration form. Easy update process of registered user. Application can be configured to run in Background, so that computer can also be used for other purposes (reception computer). Default Selectable Biometric Authentication can be set, so that application only uses default selected mode, e.g. finger Verification or finger Identification can be set for authentication module. 1:1 matching with more accuracy and in less time. 1:N matching with less FAR and FAR ratio. Continuous logging in the identification mode. Various security levels like Lowest,Below Normal,Normal(Default),Above Normal,High, Highest are present for identification/verification. Separate password protected Admin area for User registration/updation. Normal Application interface does not require credentials to allow Attendance on the first screen. Description , Email , Personal number ,Expiry_date, Group name etc) regarding user. Search registered user based on user name ,user ID , Group , User position , and also according to registration date. Max 10 fingers and min 2 finger can be enrolled , so any one registered finger can be given for identification/verification. User photo is registered which can be shown after fingerprint identification/verification. Fingerprint identification/verification logs can only be seen by admin. 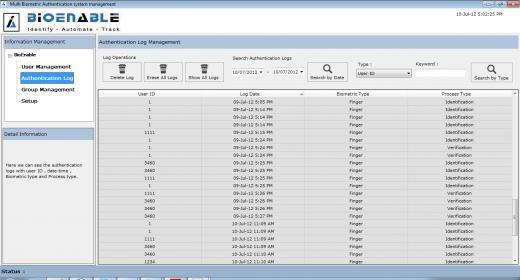 Admin can search logs based on user ID , Logs type (identification/verification) , date. 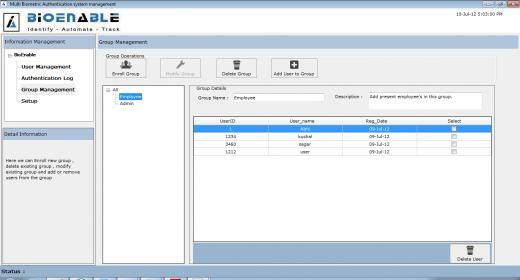 Admin can add users to particular Groups. 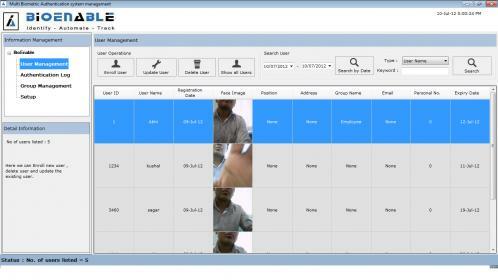 Various customization in scan time of scanner , result window show time can be done according to requirements. Web based Attendance system with inbuilt payroll. 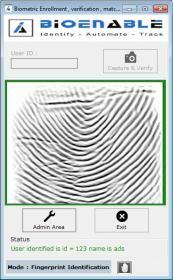 Fingerprint Identification mode : In this mode scanner is in continuous authentication mode. 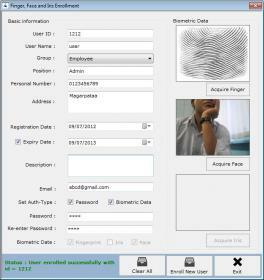 User just have to give his registered fingerprint and based on that authentication result will be shown on the system. Fingerprint Verification mode : In this mode user just have to give combination his registered user ID and registered fingerprint and based on that authentication result will be shown on the system. Add , delete users from group. Search user using date or using name , position etc. Enroll new user : Enter all the required fields and then click on “Save” button to enroll the user. Fingerprint capture : When user click on “Acquire finger” button below form is shown for fingerprint enrollment , click the check box to start enrollment . Minimum two fingerprints required to enroll user. Search logs for particular user or within particular span of time. Save logs to CSV file , Post logs directly on given link.